A high level of cholesterol in the blood is associated with increased risk for cardiovascular disease. An LMU team has now identified an endogenous regulator of serum cholesterol – which could lead to new therapies for metabolic syndrome. Heart attacks are often preceded by the development of arteriosclerosis, a chronic inflammatory reaction that results in damage to the inner walls of major arteries. The inflammation is triggered by the build-up of cholesterol deposits on the inner surface of blood vessels, but the reaction itself facilitates further accumulation of fat-rich “plaque”, which may ultimately lead to restriction or complete blockage of blood flow. Cardiologists try to prevent such an outcome by inserting a so-called stent at the site of the obstruction. This serves as a stable brace and increases the diameter of the vessel affected, thus improving blood flow. However, the intervention does involve the risk of mechanical damage to the vessel wall. The regeneration of damaged vascular tissue requires the proliferation of vascular cells to restore the integrity of the vessel wall. The protein CXCL12 – a so-called chemokine – plays an important role in this process by attracting circulating stem cells to the injured site. This effect requires binding of CXCL12 to a receptor protein named CXCR4. “But there is another receptor that recognizes CXCL12, called CXCR7, whose function in vascular repair has been unclear up to now,” says LMU clinical scientist Andreas Schober. He and his colleagues have now characterized the action of this second receptor. The researchers made use of several genetic strains of mice to explore the impact of CXCR7 on the response to direct vascular damage and to arteriosclerosis induced by a high-fat diet. 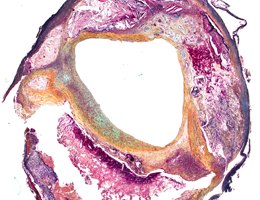 To their surprise, the investigators discovered that CXCR7 makes no contribution to the repair of injured blood vessels. Instead, it facilitates the uptake of cholesterol by cells that store fat and form adipose tissue, thus lowering the amount of cholesterol present in the circulation. Excess cholesterol in the blood can lead to dysregulation of vascular regeneration after vascular injury, which in turn increases the risk of arteriosclerosis.